This 6 lb rainbow was taken on a small Brown Trout pattern Tasmanian Devil lure fished on light spinning gear. According to Ross Millichamp of North Canterbury Fish and Game, it was probably one of the rainbows released into the Groynes from a lake at Isaacs just a few miles away. Click picture to enlarge. 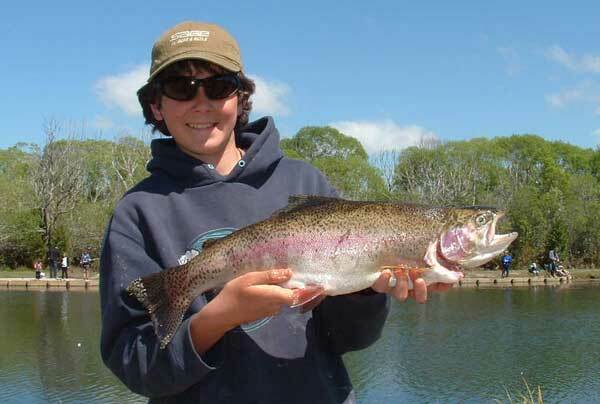 Rainbow trout caught recently during the April School Holidays at the Groynes Ponds, Christchurch. N. Z. Fish and Game release hatchery-reared trout and salmon into the Groynes each year as part of “Take A Kid Fishing.” Only juniors under the age of 17 years are permitted to fish in these ponds. Adults are allowed to assist the youngsters where needed. It is an excellent spot for young anglers to start out with a very good chance of catching a big fish. Another good rainbow trout from the Groynes. Jack Hoare, aged 15 years, caught this 7.5lb rainbow trout at the Groynes during the Take A Kid Fishing day. Jack caught it on a huhu grub under a float. The funny thing was that everyone had their lines cast out into the middle of the lake and since I had polarized glasses on I could see fish cruising about 2m from the shore. Well done jack. That fish is a beauty! Hundreds of youngsters lined the shores of the Groynes ponds to try their luck with rod and reel at the hugely popular “Take A Kid Fishing” day. The event, held on Sunday 14th of October 2001 has been organised by Dave Denton, and run with considerable assistance from Fish & Game, and numerous volunteers from local fishing clubs. Fish for dinner tonight! A proud young angler displays his catch for the camera. Fish and Game do a magnificent job stocking these small lakes. Many who get their first taste of fishing here will go on to become life-long anglers. Salmon released into the Groynes Ponds on Friday before the competition are supplied free of charge for the event by Lady Issac from the Harewood Salmon Farm. In total there were somewhere between 400 and 700 fish released for the youngsters to try and catch. Some of the salmon were quite big at 2.1 kgs. To give the kids their best chance of catch a fish without repeated casting most fished with worms. I was surprised to discover that the buckets of worms supplied to the youngsters for bait cost TAKF $700 from a worm farm! Now that’s a lot of worms. They proved to be very effective bait and would be well worth a try in other fishing situations, but always check the details on your fishing license because worm fishing is only permitted where you are allowed to fish with natural bait. Most successful youngsters fished their worms under a float on a mere long trace. A bright sunny day added to the picnic atmosphere as excited children eagerly anticipated the tug of a fish on their line. For many kids the, “Take A Kid Fishing” day at the Groynes would be their first-ever opportunity to go fishing. Judging by the enormous number of young anglers the sport looks to be in good heart for the future. Only children aged 8 years and under were allowed to fish the top and bottom lakes, by float fishing only. At the top lake, and part of the bottom lake, a team of experienced anglers provided help for each child, and also provided the rod and reel. This was a great idea giving many the chance to catch a fish even if they didn’t own a rod and reel. All children under 15 years could fish in the big middle lake. A junior fishing licence was provided for the day. There were also many experienced anglers from Fish & Game and local fishing club members on hand to provide help, lend fishing gear, weigh fish, and issue certificates of merit for fish caught. Many thanks to the sponsors, organizers, and a large band of helpers, who always make the event one that the hundreds of Children will never forget! Many young anglers are introduced to a lifetime of fishing at the Groynes Take A Kid Fishing Day. David Marshall (aged 13) with a rainbow trout he caught at the Groynes Take A Kid Fishing Day. Note the sign, the late Lady Isaac was a staunch supporter of TAKF. It was “Controlled chaos,” is how one amused parent described the scene during the 10.30am start of the annual “Take A Kid Fishing” day at the Groynes, near Christchurch recently, but as the first chaotic salvo of fishing tackle was flung into the water by hundreds of excited youngsters, nobody could deny the looks of joy on the faces of the children involved. It is these looks that continue to delight the organizers and volunteers because behind the scenes there is much preparation to ensure the success of the Christchurch event, which is typical of many others throughout the country. 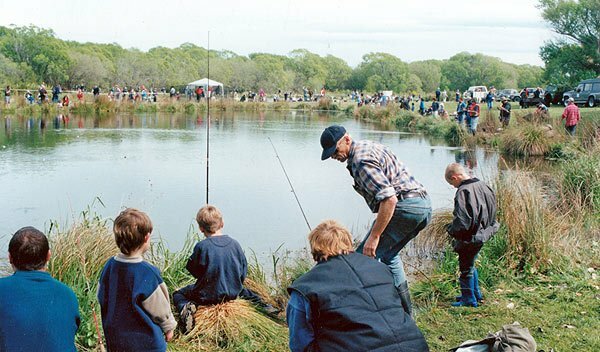 “The Take A Kid Fishing (TAKF) Day is aimed primarily at encouraging fishing and ensuring children enjoy fishing,” said Mr Dave Denton, who heads the informal committee of sports trade representatives, fishing clubs and Fish and Game Council staff responsible for the continuation of the increasingly popular day for children under 16 years of age. “They, along with Fish and Game rangers, Christchurch City Council staff, tackle shop representatives and the Kaiapoi Lions are a large number of volunteers, without whom the event would never exist,” said Mr Denton. From directing the 900 cars into parks, casting youngsters’ rods, landing fish, weighing the catch or dissecting the inevitable tangles, volunteers like Christchurch tackle retailer, Mike Gopperth and his wife Vanessa, get immense pleasure from helping with the event. “While many young children may struggle with their coordination to hold a rod with one hand and wind the reel with the other, the joy on their and their parents’ faces when they catch a fish is fantastic to watch,” said Mike. A large crowd of anglers, some very young, at a “Take A Kid Fishing” day held at the Groynes. Fishing is restricted to those aged 17 years and under. Older anglers are permitted to assist youngsters by casting their line out for them. A milestone is past for any budding young angler when he or she reaches the stage when they are finally able to cast out their own line! “Take A Kid Fishing’ is an independent body gaining funds from its own resources, and therefore voluntary support and contributions are invaluable to its ongoing success. In particular, is the continued support of Lady Diana Isaac, who each year donates more than 300 salmon and trout that are placed in the fishing ponds prior to the event by North Canterbury Fish and Game Council staff. The Fish and Game Council also issue a general fishing licence that ensures all the participating anglers comply with regulations and have a free day’s angling. This young bloke needs no assistance to cast his line. Photo: Tom Fraser. For many children, particularly those from disadvantaged backgrounds, the chance to try fishing for free is an opportunity to relish. TAKF is not new in New Zealand but originated in the United States in the mid-1980s. Then President Ronald Reagan was instrumental in establishing the event as a way of introducing children to the joy of fishing and encouraging families to spend time together in the outdoors. Like the other United States originated outdoor sports, initiatives such as Trout Unlimited and Ducks Unlimited, TAKF was soon established in New Zealand. With well-known identities such as Sir David Beattie and Murray Halberg supporting TAKF, its exposure and popularity rapidly increased. Today, most areas have an annual TAKF day, and Mr Denton hopes that in the future there will also be an ongoing marine sequel to introduce Canterbury children to saltwater fishing. 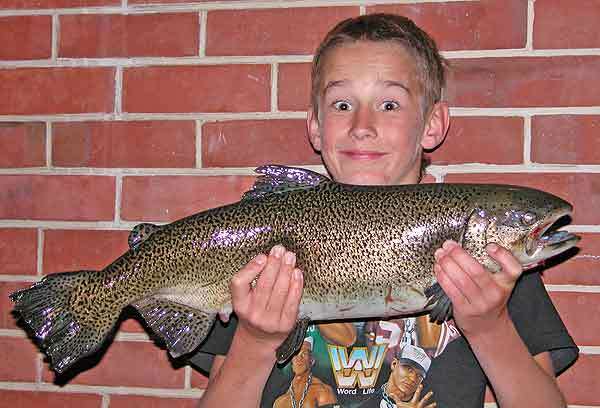 Fish & Game North Canterbury Junior Fishing Brochure (free pdf download – wait a few seconds). The day is very much family oriented. Parents, grandparents and relations are encouraged to get involved and nurture children to not only enjoy the event but continue in the sport. For those children who lack family, physical capabilities or financial resources to try fishing, the numerous volunteers who offer help and encouragement as well as the use of rods and reels, attempt to foster an interest that they hope will blossom in the future. Every child who successfully lands a fish has it weighed and is presented with a Certificate of Participation, and for those who are unsuccessful, is the hope that they continue to develop an interest in fishing and learn that there is indeed more to fishing than simply catching fish.